There’s no question that Hispanics are among the most coveted voting blocs for November’s election. Numerically, they’re the fastest growing minority group in the U.S. population. Major media regularly monitor their presidential preferences. And both campaigns have already made loud overtures to them—including the Obama administration’s directive not to deport undocumented immigrant children, and Mitt Romney’s hints that Hispanic senator Marco Rubio might be his vice presidential nominee. But while surely an important constituency, Hispanics are not the only crucial minority bloc needed for Obama to win in November. In fact, Black voters will likely be just as, if not more, essential to a Democratic victory—especially if we look beyond growth in the minority vote, where Hispanics are key, to the composition of the minority vote. This is not just because black support nationally for the reelection of the first African American president will likely be sky high, but also because of the relative demographic weight of blacks in the projected 2012 minority electorate. Black voters will be particularly important in many of the 11 swing states (Colorado, Florida, Iowa, Nevada, Michigan, New Hampshire, North Carolina, Ohio, Pennsylvania, Virginia and Wisconsin) that are key to the result of November’s election. 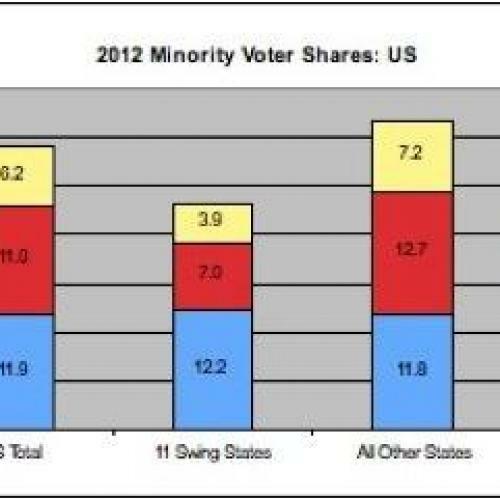 Taken as a whole, Blacks comprise 12 percent of these states’ combined electorate, compared to 7 percent for Hispanics and 4 percent for those who are Asian or “other race.” Figure 2 displays minority eligible voter shares by race-ethnicity, for these 11 states, along with the number of electoral votes for each state, organized by region. Our analysis is based on calculations of eligible voters—citizens age 18 and older—by race for May 2012 drawn from the US Census Bureau’s monthly Current Population Survey. Yet, for five other swing states—North Carolina and Virginia in the South, and Pennsylvania, Ohio and Michigan in the North—blacks are clearly the dominant minority voting group. Moreover, all these states are relatively populous, ranging from 13 to 20 electoral votes, and represent a total of 82 electoral votes. 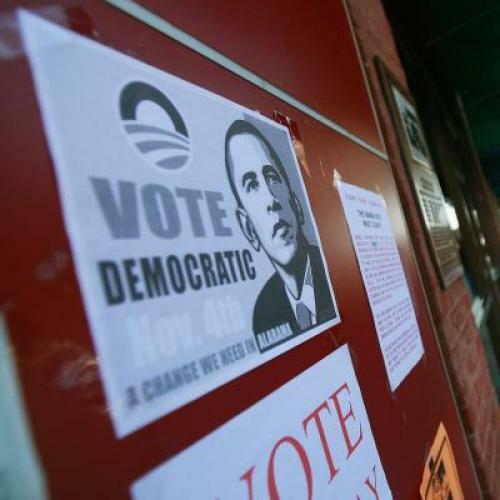 In 2008, North Carolina and Virginia shattered recent precedents by favoring the Democratic candidate Obama, in large part because of the strong turnout and Democratic support of their substantial African American eligible voter populations. In each of these states, African Americans now constitute about a fifth of eligible voters and in North Carolina, in contrast to most other states, the black share of eligible voters has actually gone up over the last four years (from 20 to 21 percent). While each of the three large northern industrial states is generally “whiter” than those in the South, the smaller African American dominated minority vote in two of these states was responsible for Obama victories in 2008. This was because in Ohio and Pennsylvania black turnout and margins for Democrats increased over 2004, providing enough of a cushion for Obama to override deficits among whites. Also worth noting: In both of these states, the black share of eligible voters should be about a percentage point higher in 2012 than in 2008. The remaining three swing states (Iowa, New Hampshire, Wisconsin) have smaller minority eligible voter populations and, in each case, whites as well as minorities voted for Obama in 2008. Yet this time it could be closer and their relatively small Black and Hispanic populations could well make a difference. There is no doubt that the Hispanic population will dominate minority and youth-oriented politics for the foreseeable future, since Hispanic children now comprise 23 percent of U.S.-born children under 18—all of whom are future eligible voters. Yet in the current election, black voters will still have a large say in the outcome—especially in swing states of the industrial north and “new south,” given their continued demographic strength. Since white voters are likely to be more Republican-dominated than in 2008, according to recent polls, a Democratic victory will be highly dependent on an energized voting base of minorities—both Hispanics and African Americans. William H. Frey is a demographer and senior fellow at the Brookings Institution. Ruy Teixeira is a senior fellow at the Center for American Progress and editor of America’s New Swing Region: Changing Politics and Demographics in the Mountain West, recently released by Brookings Press. Their previous piece for TNR on the demographics of the 2012 electorate can be found here.